Along with the many other dental treatments Prosthodontics of Princeton offers to those in the Princeton area, dentists Dr. Steven C. Isaacson and Dr. Suzanne B. Reinhardt provide dental implants to those who need replacement teeth. 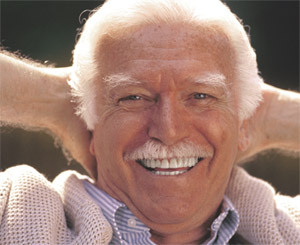 Dental implants act as natural-looking replacements for missing teeth. A natural tooth consists of a root and a crown. If you compare natural teeth to implant-supported replacement teeth, you’ll see they have the same basic parts. Both have a crown (the visible part used to chew food) and both have a root that holds the tooth securely under the gum and is anchored into the jaw. The difference is that the dental implant is made of titanium – the same time-tested material used by surgeons for artificial joints. When you lose a tooth, you lose both the root and the crown. To replace the tooth, our dentists first replace the root with a small dental implant. Time is allowed for bone to heal and grow around the dental implant. The bone bonds with the titanium, creating a strong foundation for artificial teeth. A support post (abutment) is then placed on the implant and a new replacement tooth (crown) is placed on top of the abutment. In many cases a temporary replacement tooth can be attached to the implant immediately after it is placed. If all of your teeth are missing, a variety of treatment options are available to support the replacement teeth. Dental implant placement is a team effort between an oral and maxillofacial surgeon and a restorative dentist. The surgeon performs the actual implant surgery, initial tooth extractions, and bone grafting if necessary. The restorative dentists at Prosthodontics of Princeton fit and make the permanent prosthesis. Dr. Isaacson and Dr. Reinhardt will also make any temporary prosthesis needed during the implant process. Dr. Reinhardt and Dr. Isaacson strive to provide top of the line dental care for their Princeton area patients, so they use the most recent advances in dental implant technology. The techniques and equipment used at our Princeton office allow our dentists to place single stage implants, making the overall dental implant process more convenient and less invasive for the patient. These dental implants do not require a second procedure to uncover them, but do require a minimum of six weeks of healing time before artificial teeth are placed. There are even situations where the dental implant can be placed at the same time as the tooth extraction – further minimizing your number of surgical procedures. If you would like to learn more about the dental implant process, please contact us and one of our staff members will be happy to assist you. If you would like to book an appointment with Prosthodontics of Princeton to begin the dental implant process, use our online form to let us know when you’d like to visit our Princeton, NJ office. Our dental team looks forward to restoring your smile with premier dental implants! For more information about Dental Implants or to schedule a consultation with Drs. Isaacson and Reinhardt, call our office in Princeton, NJ at Prosthodontics of Princeton Phone Number 609-924-1975.